As you teach Primary 2 Lesson 2: I Can Choose the Right remember that your goals is help everyone understand that as we think about what Jesus would do, it helps us know how to choose the right. Play the fun board game included in The Red Headed Hostess class packet. For the older classes, try the more challenging CTR coloring page from LDS Lane. Play my CTR Bingo! as you discuss the questions. Strengthen your testimony before you teach. "Teach Me to Walk in the Light"- Children's Songbook pg. 177 or Hymn #304 or watch the Mormon Tabernacle Choir sing it. Walk His Way (about 3 minutes)- Music video about choosing to walk in the ways of the Lord. CTR shield sticky note activity. Have the children write one way they chose the right that week in the shield and stick it on the board. If you like these helps, please pin it too. Thanks! This topic is extremely similar to last week's. I've included a few different things but you'll want to go back a lesson to get more CTR activity ideas. 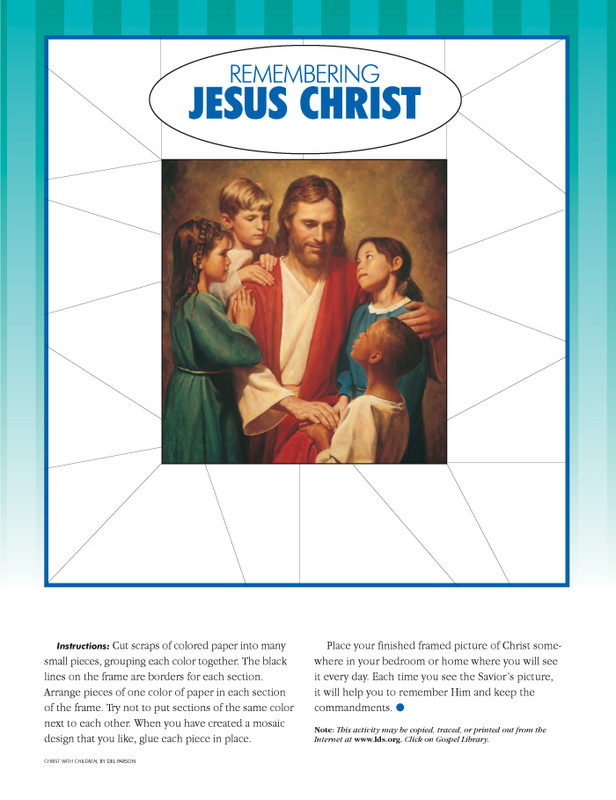 Remembering Jesus Christ- Picture of Jesus- You make the frame around it. You can fill it in with ways to choose to right, color it, pieces of paper with phrases on it, or tissue paper.